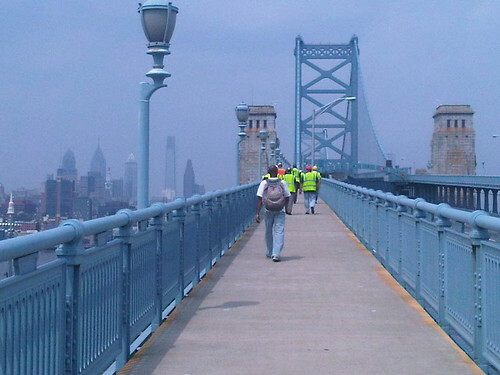 The South Walkway of the Ben Franklin Bridge is once again closed for construction and the North Walkway is open "until further notice". We are not sure of the details of the construction project but last Thursday a cadre of what appeared to be bridge engineers were seen on the South Walkway. UPDATE: Construction is for the continuation of fiber optic work. The DRPA expects that the South Walkway will be reopened in about a month but if the weather cooperates it will be sooner.